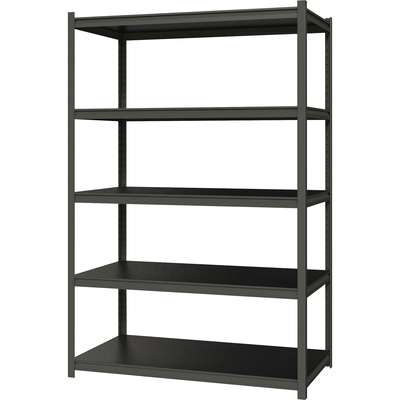 Iron Horse Shelving features a rugged, boltless design for easy assembly and professional appearance. Each five-shelf unit holds a total capacity of 3,200 lb. of evenly distributed weight. Black laminated shelves are water-resistant and supported by a heavy-duty steel frame with a smooth, rust-resistant, powder-coat finish. Shelves are made of sturdy particleboard that is CARB Phase II compliant. Assemble vertically or horizontally in less than 30 minutes with a rubber mallet. Concealed rivets deliver a clean look.